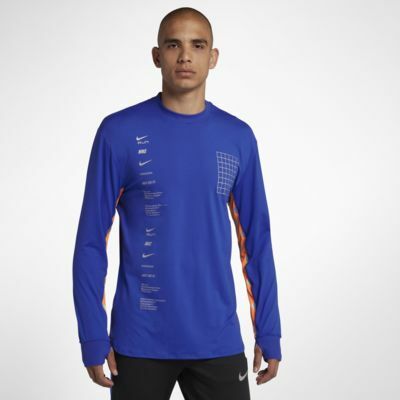 Ideal for chilly runs, the Nike Dri-FIT Element Top helps keep you warm without overheating. Reflective details include iconic graphics found on the bottom of Nike shoeboxes and a polka-dot print laid over the bright side-arm panels to help you stand out. IDEAL LAYER FOR CHILLY RUNS. Fabric: Body: 88% polyester/12% spandex. Mesh: 89% polyester/11% spandex. I like the design but the shirt is way bigger than I expected, I wish I could return it but took labels off. If you are a S size like me don't bother buying. How did Nike get the sizing so wrong with this? Great looking but runs super big. Looks awesome but had to return a medium and then even the small was too large. It’s a shame when I went back to exchange for an X-small, they were out of stock in that size. Normally wear a medium in Nike tops.